Bedroom lighting is very essential part of Bedroom interiors as it can enhance the ambience of bedroom dramatically as well as increase the utility of the very corner of your bedroom. But to choose a right lighting for your bedroom can be challenging as there are many types of lighting fixtures are available in the market so it become little bit difficult to select the right lights for your room. You do not need the bedroom lights for whole day but while cleaning, Getting dressed, reading your favorite book and making beds good lighting makes the job easier. •	Overhead Lighting for bedroom is the simplest way to light a bedroom as it will leave the outside walls dim but will suffice as a minimum. These overhead lights can be fixed in the ceilings and sometimes they hang down like chandelier. This will give a beautiful glow to your bedroom. This light can be added to the fan to get complete coverage of the entire room as well as look very stylish and elegant. •	Task Lights for bedroom as the name suggest need to perform tasks such as reading, studying, cooking, applying makeup, etc so these lights are also important for your room as bedroom can be used for multiple functions especially reading and dressing up yourself. Table lamps, Desk lamps, Adjustable floor lamps, Pendant lights, Sconces are some of the task lights which can be used in bedroom. •	You can place Track lighting or spot lights near the wardrobes to provide direct light into the wardrobes. These lights can make your work easy in finding the clothes and other accessories from your wardrobe or cabinets. •	If your bedroom has a tray ceiling with cove moldings than using cove lights is the best suited lights for bedroom. It can add some real mood lighting in a bedroom. 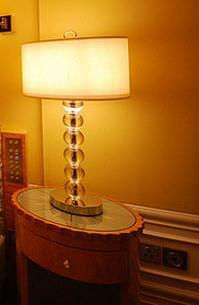 •	Floor lamps are the best idea for bedroom lighting as they do not need more space to add and can be used in corners. •	If you have a dressing table in your bedroom than try to place it near the window so that you can get natural light, but if it is not possible than Buffet lamps are perfect for this as they don't take up much space, yet have a powerful soft glow. •	Add a dimmer switch to every light in the room. •	Always try to get as much as natural light you can. •	Choose the lighting shades according to the colors of your bedroom wall. •	Make sure there's enough light near reading or work areas. •	Choose the right location for placing your lights, Don't install lights directly over the bed.